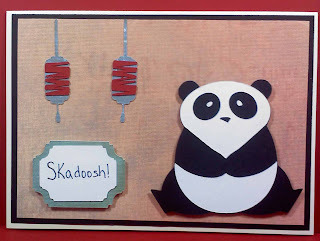 From the lovely saying on Kung Fu Panda - Skadoosh!!! That part of the movie was so funny. My brother really loved that part as well so I decided to make him a card w/ that design on it. I really love this Panda. So Cute!!! I used the Pagoda Cricut cartridge for this card and then the Songbird cartridge was used on the word frame.